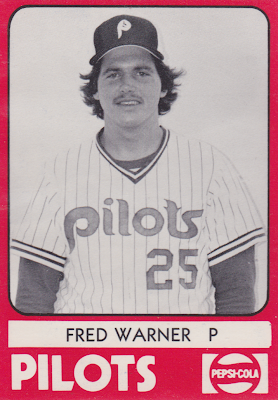 Yesterday's 1980 Peninsula Pilots placed in the MiLB Top 100 All-Time teams, thanks to their 100-40 record and runaway Carolina League title (set profile). While comparatively less successful on the field, these 1980 Waterbury Reds sit atop my list of all-time player names. Here are my faves from their TCMA checklist. Paul Herring. On the Reds. Yup! Paul hit decently in 7 minor league seasons (career stats), but didn't peak high enough to reach the bigs. After a slow start for Waterbury in 1982, he signed with Tabasco of the Mexican League and finished his pro career with another five years south of the border. 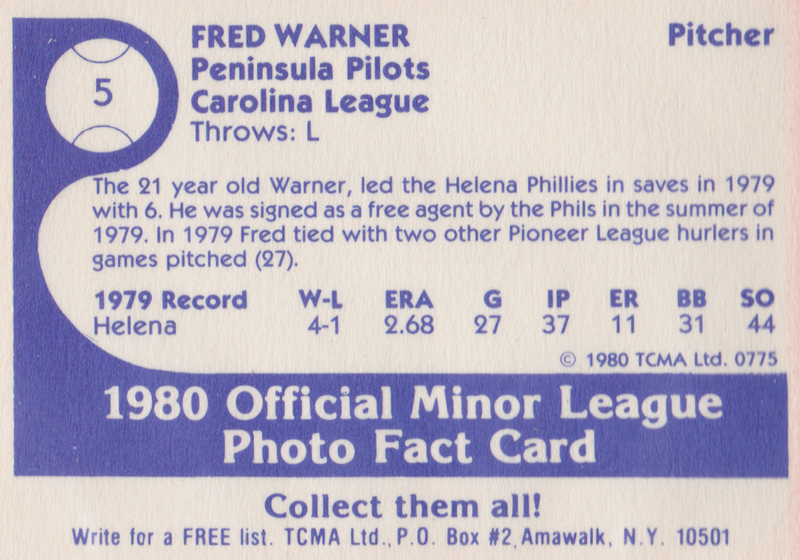 Value: 1980 TCMA singles cost a dollar or two and none of the Waterbury players became famous enough to reach star value. Fakes / reprints: Thanks to Ryan at Cardboard Zoo, we know some black-backed (instead of the pictured blue back) TCMA cards went into post-1980 collectors sets. 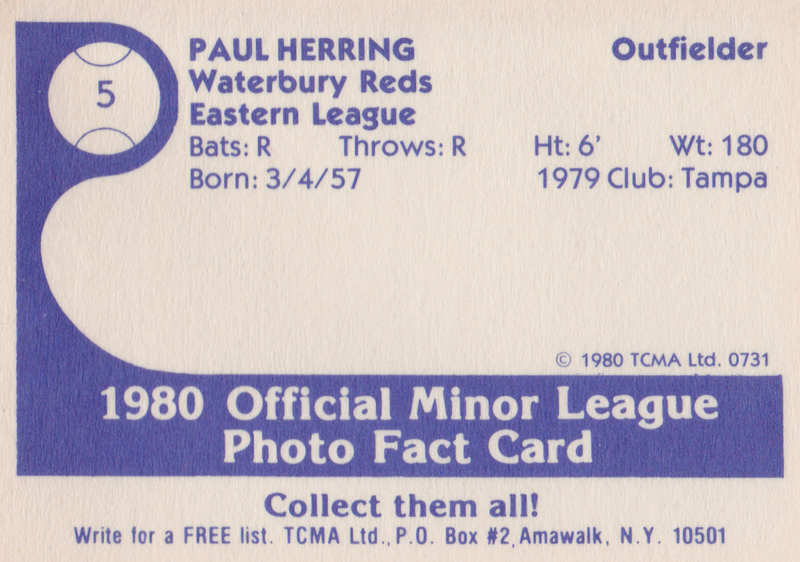 Find out more at his own 1980 Waterbury Reds post. Baseball's not a kind game to most players. Even with pro teams dotting all of North America, the opportunity for success falls between slim and none. Greg Kline's own minor league stats show how most pros experience America's pastime: a brief year or two of scorching summer practices wedged between high school and their "adult career." Being born and raised in Pennsylvania, Greg's first month in Bristol, Virginia probably felt fun and close to home. By the start of that second season on Iowa's river banks, though, I bet he was looking at other options. 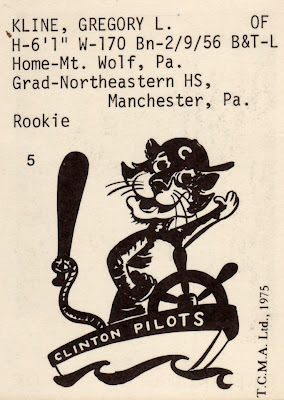 Like last week's Wausau Timbers, the Pilots spent some time as a co-op affiliate of multiple teams, fielding players from five MLB franchises in 1976. Jim Leyland managed for three years in Clinton and 11 total in the Tigers minor league system, making his current stint with Detroit a homecoming of sorts. Value: Find most 1975 TCMA Clinton Pilots singles at CheckOutMyCards for $2.50 each. Fakes / reprints: Haven't seen any in the marketplace, though it'd be easy to fake with modern equipment. Black-and-white photography is often all about contrast and light balance. One well-framed cloud over a canyon, for example, makes for thought-provoking art. 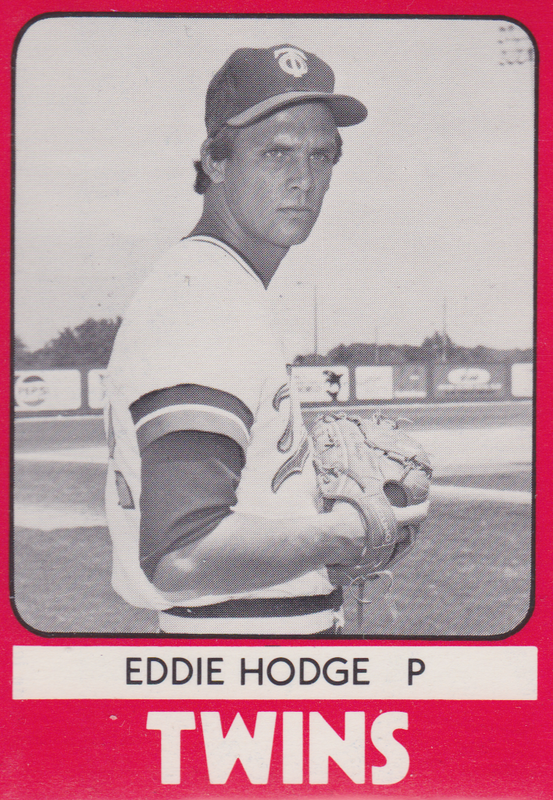 Did you know: Hodge is one of just five guys to pitch exactly 100.0 career innings in the majors, going 4-3 for Minnesota in 1984. 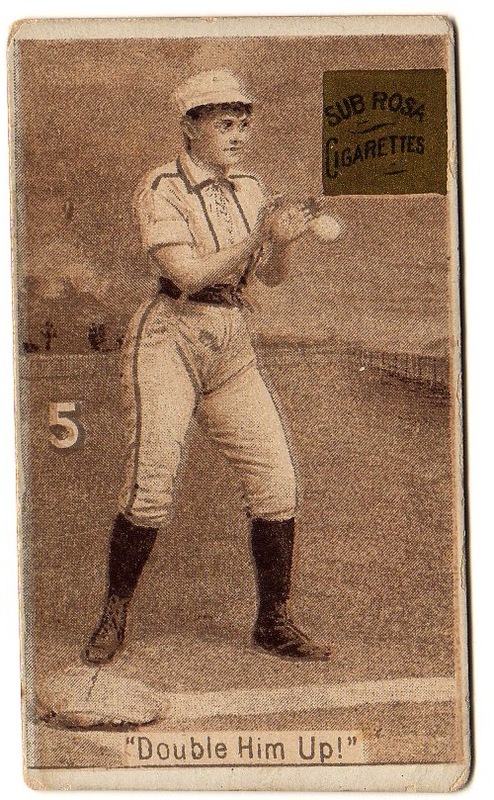 Only he and Jack Bracken (Cleveland Blues, 1901) hit the century mark during a single season. 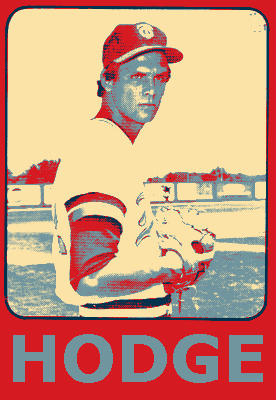 After some tweaking, I found a new take on Eddie's high-contrast original, with apologies to Shepard Fairey. 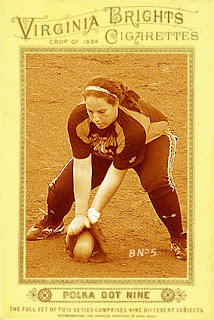 For those who don't like stripes: huge catcher's mitt! They make any uniform awesome. Minor league rosters being fluid like they are, Cliburn moved from the Angels to the Pirates organization later that year and both men spent 1981 as opponents in the AA Eastern League, Mike catching for Holyoke and Stan for Buffalo. 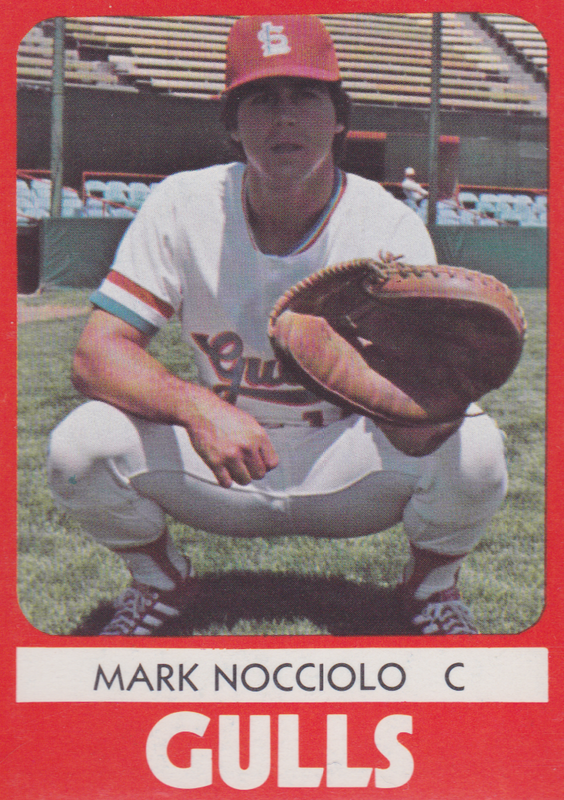 Though Nocciolo hung up his gear after 1981, Cliburn went on to play for nearly two decades and continues to manage at the minor league level. 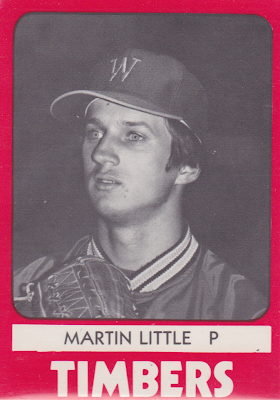 As of 2011, he helms the American Association's Sioux City Explorers. Value: This #5 cost $2 at MinorLeagueSingles.com, about right for singles from that era. Props to White Sox Cards for its current run of Virginia Brights custom cards, celebrating all nine fielders on the Chicago Bandits. Here's scorecard position #5, third base. Some old school sets (we're talking 19th century) featured ladies dressed for baseball, though with studio models instead of real players. That's the story with this 1886 Sub Rosa Cigarettes #5, which remains my type collection's oldest card. Dave Stockstill's pro career started fast, thanks to good power with the bat and a strong outfield arm. 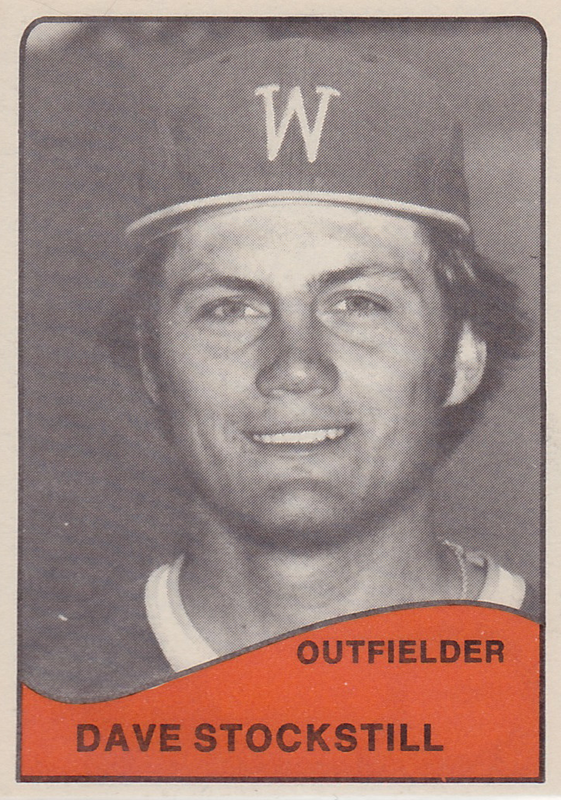 This half-blank card back should reflect time with two Cubs rookie league teams in his first season (1978), which preceded an impressive .933 OPS and league MVP award playing for Wausau in 1979. TCMA offered two designs for their minor league team sets, full-color or black-and-white, no doubt charging less for the latter and its cheaper card stock. 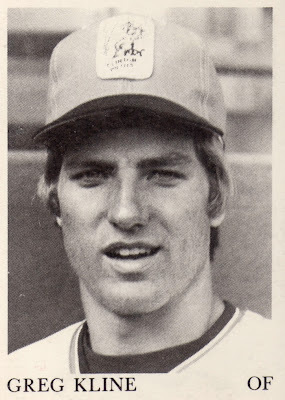 No one from Wausau's 1979 team set the sport on fire, though Harmon Killebrew's son Cam played one of his pro seasons in their outfield alongside Stockstill. Value: Dave cost $2 at MinorLeagueSingles.com, typical of non-star minor league cards from that era. 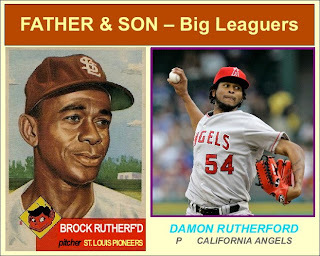 Starting to see this year's National pop up in more and more card blogs, so people must be getting excited. I'll be at the show in Chicago, too, searching for cards and talking to other fans. Want to say hi? Post a comment below or send an email and we'll figure out a place to meet. 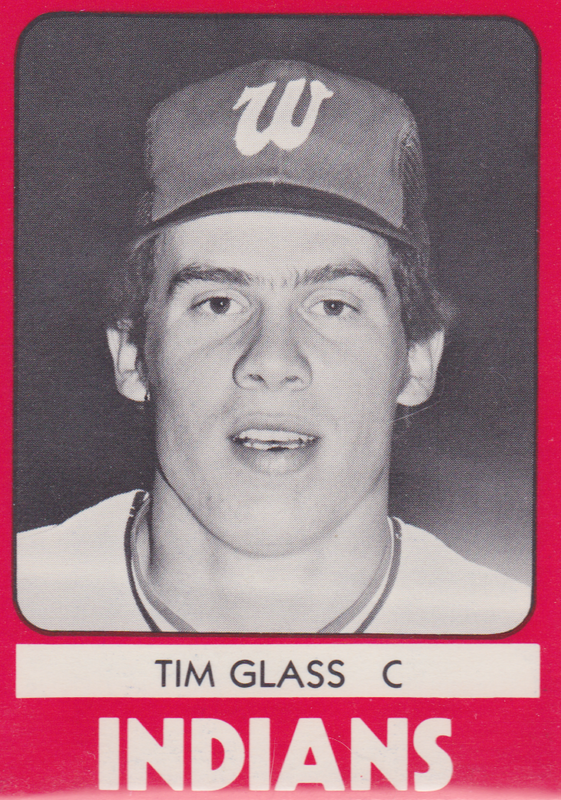 Quick shout-out to #5 site follower Kirk, a man dedicated to collecting at least one autographed card of every player to don the Baltimore uniform. 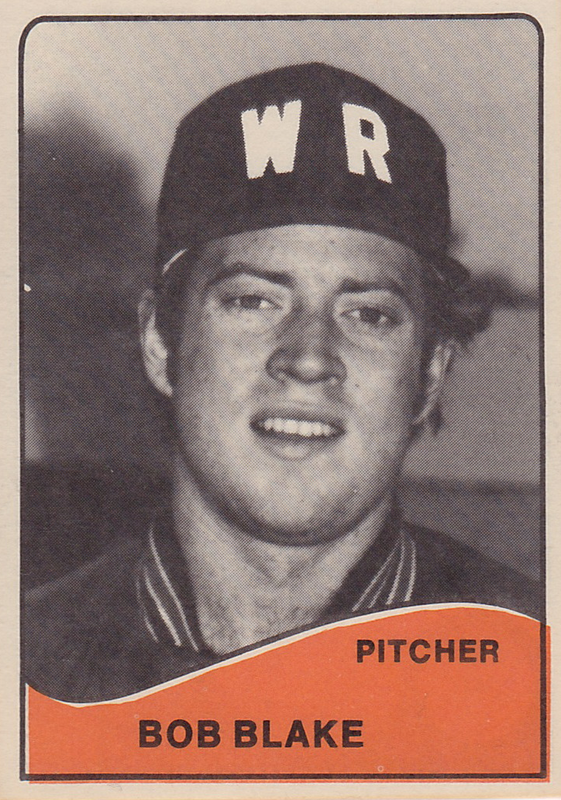 He's written regularly about this search since 2009 at Eutaw Street Cardboard and recently crested 75% of known Orioles, an amazing 672 different guys. 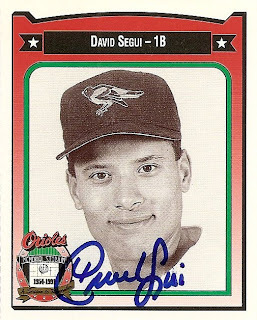 My own player collection includes former Oriole and great glove man David Segui, so you know that this March 2010 post with five (!) signed cards caught my eye. Segui's apparently a good signer and Kirk added a note about his in-person courtesy. Segui is a great signer. I went 5 for 5 this time with the Crown card in the mix. In my requests I stress the importance of the Crown card to my collection and ask for it to be signed above all else. Segui actually read my letter before signing and the Crown card is without his usual inscription MATT 16:26. After all of my bitching last week it seems there are players out there that do take the time. My faith has been restored. Visit Eutaw Street Cardboard to see (plenty) more autographs and Baltimore Orioles cards or check his "Vault" section to spin a trade. 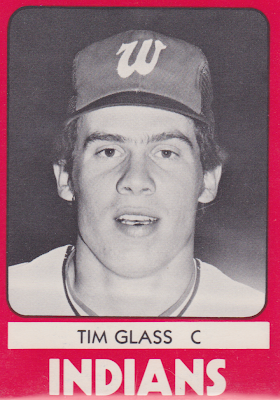 Most of TCMA's early (pre-1978) minor league sets profiled Iowa-based single-A and AA teams, squads full of recent draftees, college grads, and international players seeking American pro success. 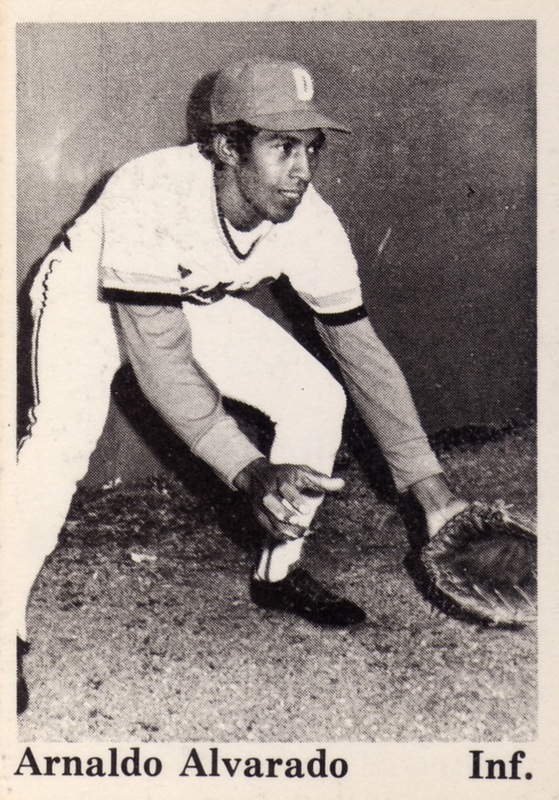 Today's guest, Venezuelan native Arnaldo Alvarado, played in both Cedar Rapids (1974) and Dubuque (1975) as an aspiring MLB infielder. Unfortunately for Arnaldo, he didn't slug well enough to balance a .200 average, so lasted just two seasons among the tall corn before returning to the Caribbean's winter leagues, where he found more success and played into the 1980s. What comes to mind when you hear Dubuque? 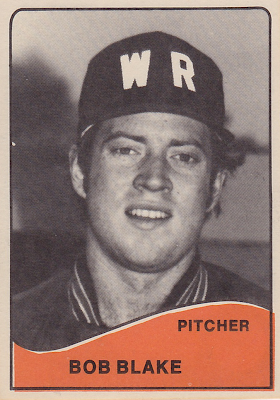 Is it "Talkin' Baseball?" 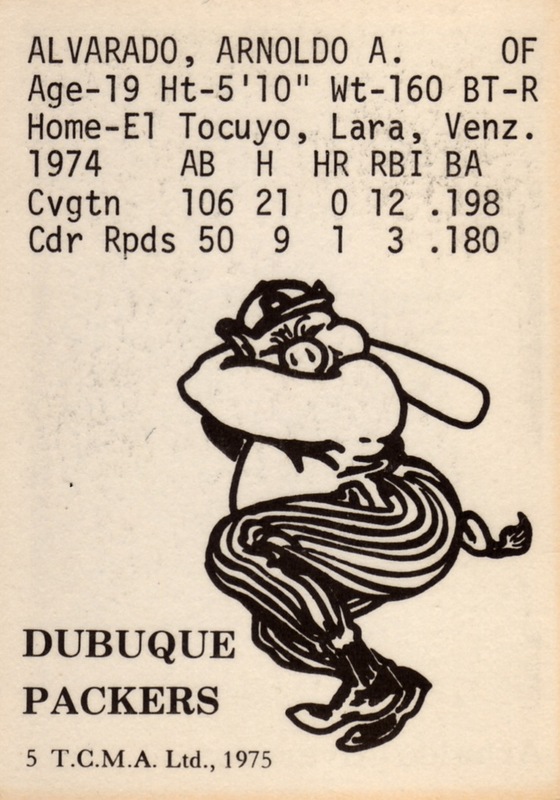 They knew 'em all from Boston to Dubuque. For "fans of a certain age," this song (and its many variations) entered your brain and stayed there forever. 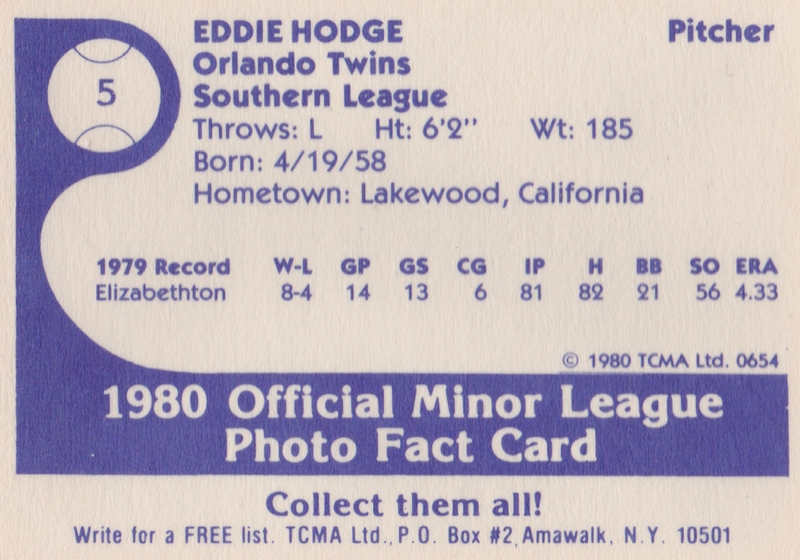 It's like sweet, nostalgic baseball candy. Big congratulations to composer Terry Cashman, who'll be honored at the 2011 Hall of Fame weekend and perform his seminal tune in Cooperstown on July 23. As with football's Green Bay Packers, Dubuque's team name references the local meat-packing industry, so made their logo a bat-swinging hog. 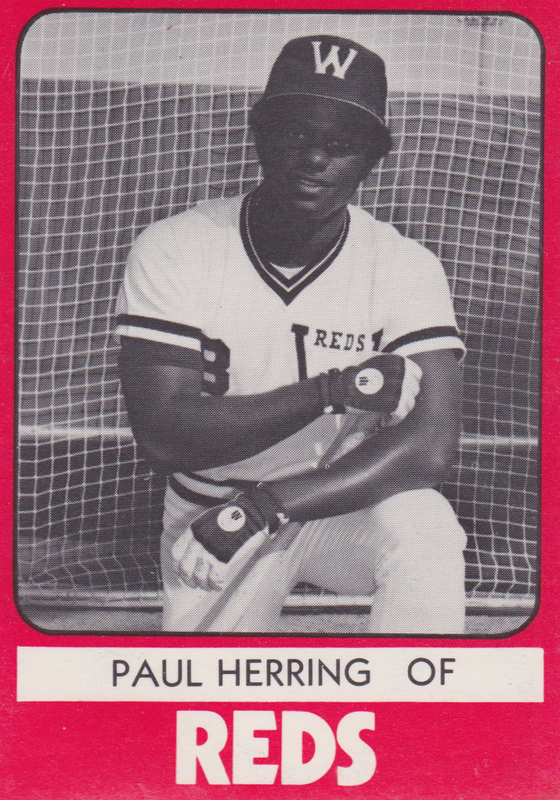 Not sure if they wore those striped pants, but it would've been short-lived; an affiliation change to Houston's Astros in 1975 included a new rainbow jersey to mimic the parent club. See the Sports Design Blog's team profile for details, as well as scans from TCMA's 1976 team set. Value: Arnaldo cost $2.50 from MinorLeagueSingles.com. Fakes / reprints: Several players from this team reached the majors, including regulars Terry Puhl and Luis Pujols, but doubt anyone reprinted the set itself. It's been three days since July 4th here in the U.S., just long enough to come down from all those patriotic burgers, bratwursts, and BBQ ribs. Stomachs don't feel so crazy anymore, eyes don't bulge at the sight of mayonnaise, and belts fit a little better. Does that make it safe to talk about food cards? Potato chip food cards? Let's hope so. Num Num Foods, makers of pretzels, chips, and other snacks, published a pair of vintage photo sets profiling the Cleveland Indians. 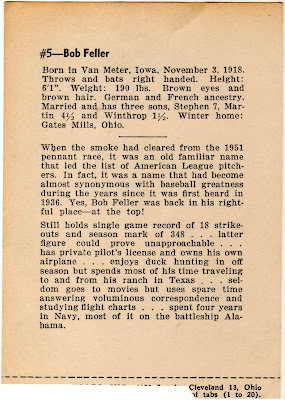 They started with an unnumbered 36-count version sold as a "photo pack" to stadium visitors in 1949 (and by mail in 1950), which included facsimile autographs on the front and promotional hand stamps on the back. 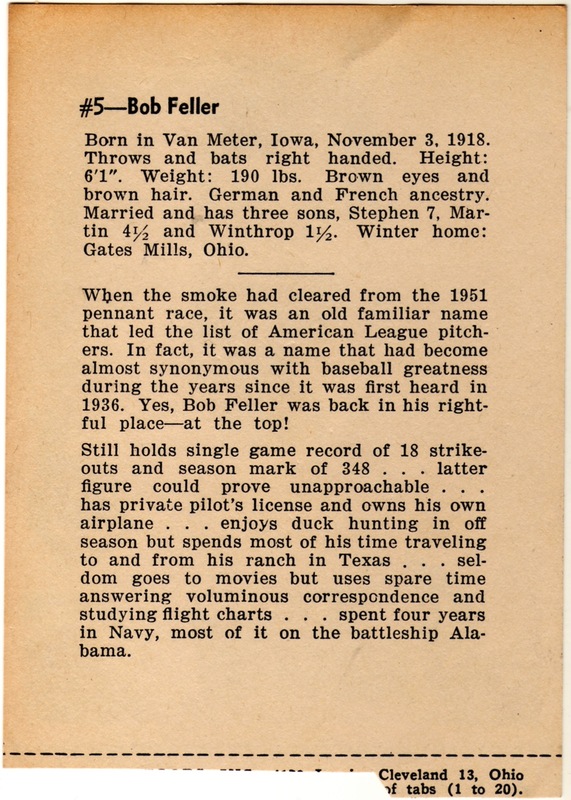 They followed it in 1952 with two permutations of a numbered 20-card set, one (like Bob Feller) with a cut-away tab below its picture and another without, the latter published by the team itself. 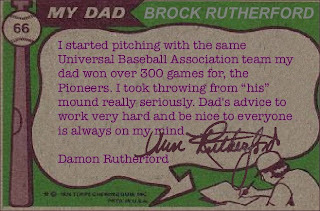 Today's card got an awkward trim because Num Num buyers could trade a complete set of 20 card tabs for an autographed baseball. 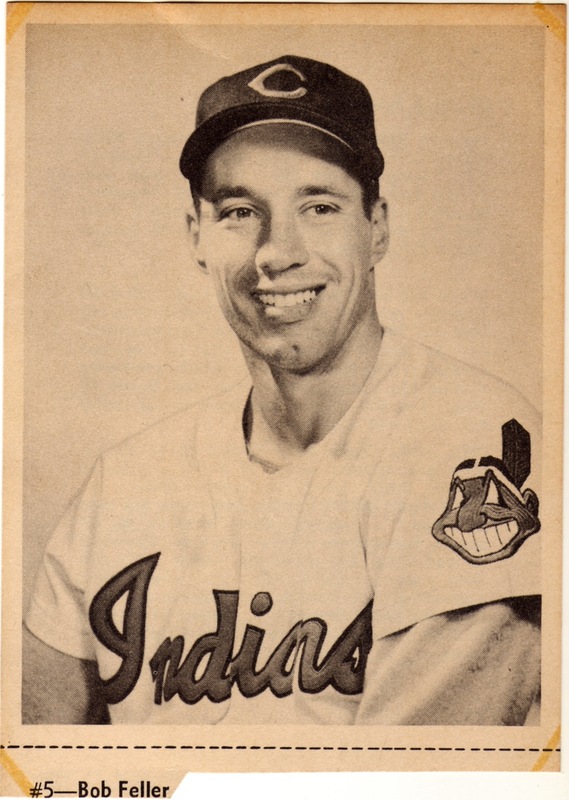 Someone snipped the redemption tab away but wanted to save "#5--Bob Feller" on its front. Hope they still got their ball! Hat tip to blogger ALL TRIBE BASEBALL for pictures of the Bob Feller tribute (and post-game fireworks) at Cleveland's 4th of July, 2011 game against the Yankees. There's a great statue of Bob and his sweeping leg kick delivery outside the stadium, always worth a visit if you're in the area. Value: This Feller cost me $45 on eBay a few years ago. Trimming the tab knocks a card's value down at least by half, in addition to any other damage or staining. Fakes / reprints: Haven't seen any personally, but assume there have been modern reprints, given the ease of doing so with current technology. I'm off to Wisconsin in a few days, so let's kick off the 4th of July weekend by checking out a team from the Great Lakes region. Today's guest, Bob Blake, turned his 11-game 1978 single-A debut season into a nice start for 1979, picking up 7 wins early and earning a midyear promotion to Minnesota's AA affiliate in Orlando. It's hard to imagine culture shock like switching from dairy farms to Disneyland, but I know what I'd miss: pasties. 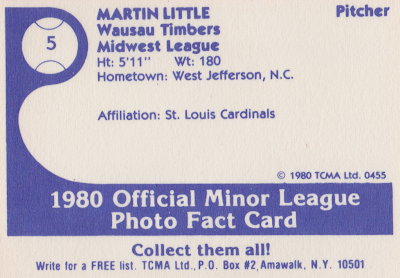 This erstwhile Twins affiliate franchise played 21 seasons in Wisconsin Rapids, at what looks like the state's geographic center. (It's eerily centered, almost a target dot.) 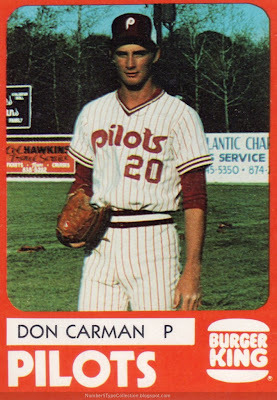 Even though they folded back in 1983, a connection lingers to current-day ball through Phillies manager Charlie Manuel, who served his very first year during the squad's very last season, going 71-67. After parent club Minnesota bumped Blake from single-A Wisconsin Rapids to AA Orlando, he pitched about the same number of innings, but gave up a bunch more homers and runs. As a St. Paul resident, I suspect Bob preferred the northern climes to a possibility of toiling for years in the Florida sun, so hung up his cleats after 1979. You could fit stats for his two pro seasons on this black back, so I did so, thanks to his Baseball-Reference entry. Value: This #5 cost $2 at MinorLeagueSingles.com, about right for non-star minor league cards. Fakes / reprints: Haven't seen any in the marketplace, but you could fake the look pretty easily with modern equipment.